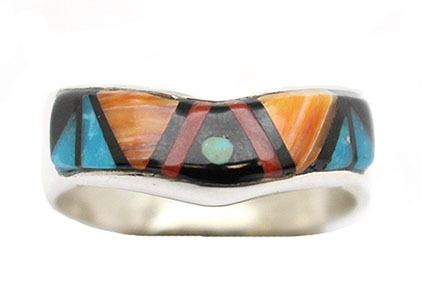 Sterling silver cast shank inlaid with spiny oyster, turquoise, coral and jet. It measures approximately 1/4" long by about 3/4" wide across top of ring. It is Navajo hand crafted and inlaid by Rita Ybarra. Inlay patterns are basically the same but the colors vary. Available in spiny like picture in size 8 1/2, or lapis with turquoise in size 8, 9 or 9 1/2 or green turquoise with blue turquoise in size 8 or 9 1/2. All will have other colors as well. Choose color and size when ordering.